Macon Food Story, Chapter 10: New meat processing plant headed to Monroe Co. Switching over to the meat industry in Central Georgia, farmers have to get their animals processed or slaughtered in order to sell it to consumers. 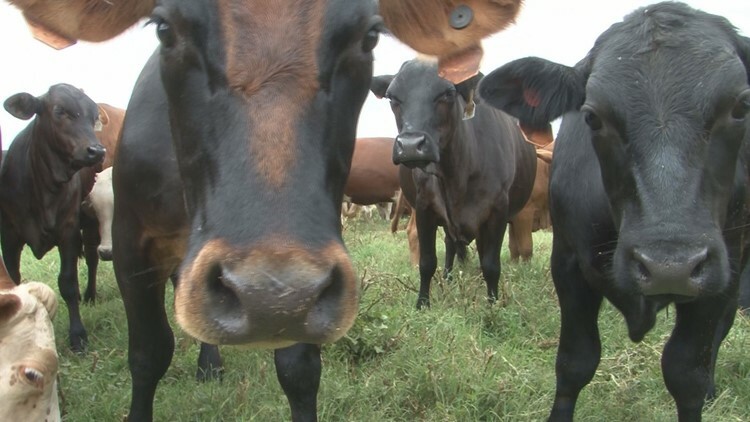 It's about to get a lot easier for farmers and 13WMAZ's Suzanne Lawler has what that means for you. "At my first farmer's market, I sold six pounds of ground beef for $36 and I thought, 'This will be fun. This will be some beer drinking money,'" recalled Joseph Egloff. The Rocking Ranch supplies meat to five Central Georgia restaurants and you can frequently find them at local farmer's markets. To get there, it starts on a plot of land in Monroe County. "I'm more of a grass farmer than a cattle rancher. You take care of the grass, the grass takes care of the cows, and the cows take care of you," he said. He checks his cattle every day. The heifers produce the cows that eventually go to processing. The processing will happen just up the hill now instead of somewhere down I-75. "We're standing at the site where the processing plant will be built. It will have the capacity to run about 30 head a week," he said. It's a big deal because Central Georgia doesn't have a processor like the one the plant will have within a 100-mile radius, which means farmers have to travel every time they want to generate sausage, ground beef, or steaks. "Last year, I spent $95,000 at the processor in Tifton," said Egloff. State Agriculture Commissioner Gary Black says the state of Georgia simply doesn't have enough processing plants. "There is a huge need for more processing facilities to do custom work and have it inspected. People want to know where their food comes from," said Egloff. The production will include sheep, lamb and hogs. Tammy Albert owns Jail Creek Farms and says she's excited. "It would save us a lot of money because you look at fuel costs involved. You're hauling livestock several hours away and back, and then you have to go back several weeks later to pick up the meat and those costs can get pretty hefty," she said. "I'm excited in many ways because this was a long time coming," said Egloff. Those are big plans that morphed from beer money to something that can continue to support a booming business in the region. Egloff says they are animal welfare approved, which means they will slaughter the animals humanely. They will also qualify as an organic processing facility because they won't use bleach, but other approved cleaning materials instead.